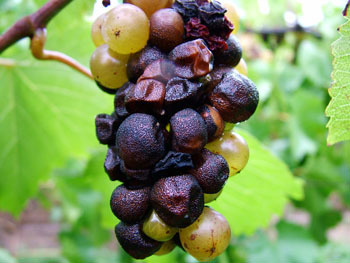 There are actually two different fungal diseases that cause grape rot. The first occurs while the fruits are still green. and first shows up as yellow to brown leaf spots that enlarge to about one quarter inch. Lesions appear on the shoot and the stem too. This disease is called Black Rot and it spreads to the green fruit which quickly dry and turn into “mummies”. Often the entire cluster is affected so an alternate name for this disease is Bunch Rot. The other is Bitter Rot which shows up closer to harvest, when it is indeed “Bitter” for the grower who was looking forward to a bumper crop. The ripening grapes eventually turn soft and brown but if eaten while they still look OK they have a bitter taste. 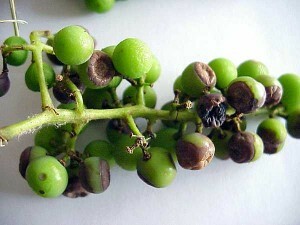 The berries may die and remain on the stem where they eventually become mummies. The first defense against either rot is sanitation. This winter prune out any diseased parts of the vine, including mummies, of course, and clean up any leaves and berries on the ground. Disinfect your pruners between cuts. Next year keep a close watch and cut off any leaves that show yellow spots. Again, disinfect those pruners between cuts. Improving air circulation by pruning out excess growth can help too. You can find fungicides for both these diseases in Garden Centers. You may also find combinations of copper, sulfur and lime, such as Bordeaux mixture which are considered organic fungicides. Be sure to read the label for any product to make sure it meets your needs and plan to rotate between various sprays with different modes of action to avoid building up fungal resistance.